I am so excited about the new Karen Burniston dies coming soon. Karen and the design team are doing sneak peeks of the upcoming products, and they are fantastic!!! 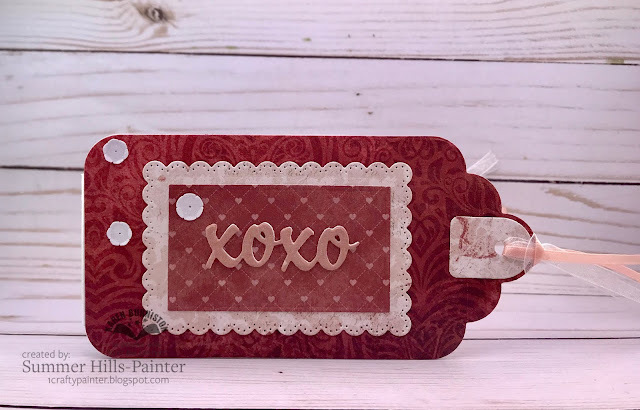 Here is a card I made using the new Heart Pivot Panel die set. I know that I have said it many times before, but it is still true today. I love how all of the new dies work with the other dies released. It is a great way to build your crafty stash and continue to use what you have. For this card, I have used the Tag Book Pop up die. On the front, I have added the new Word Set 9 die set along with accessories from the new Rockin' Rectangle die set. Here is the inside of the card. I have added the Heart Pivot Panels along with pieces from the Circle Tag Book, Oval Frame, and Word Set 9 die sets. Thanks for stopping by! Be sure to check out what the other team members have created with the new die sets.